Review: Blue Ribbons & Burlesque | Oh, The Glamourous Life! Despite being so close to finished with this reviewing project, I bought another book. I couldn’t help it — I’d just been to a local fair. 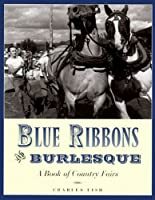 Blue Ribbons and Burlesque: A Book of Country Fairs, by Charles Fish (2003). In 1969 and 1970 Charles Fish photographed local fairs in his home state of Vermont. Years later he complied them into this collection of images and reminiscences from himself and people who were involved in the fairs. The folks he interviewed also helped identify the subjects of the photographs (who were occasionally themselves). The book examines animals as objects of beauty (prize cows), strength (ox pulls), and speed (horse racing), wanders down the midway to the games, rides and food, views the midget car race track, and at last visits the girlie shows. Despite “burlesque” being in the title, it’s just one short chapter with about 2 dozen photos of the exteriors of the shows. The anecdotes were interesting — a woman turned away from a show came back with her hair under her hat and dirt smudged on her face, looking enough like a man to get in. But the information is generally pretty thin. If you’re really interested in carnival girl shows, read Girl Show instead. Although it was charming to read, I can’t recommend it as a burlesque book. There’s too little on the topic to be worth it. One more review down. If I don’t buy any more books, there are only FIVE left! P.S. The fair I went to had no girl show, although there was a “live” mermaid.